Left-handed people have it hard enough. From bonking elbows, right-handed desks and inky pens, they deserve a break. Help them out with the correct door handle. Most people don’t know the difference between a left-handed and right-handed door. It’s one of those things you don’t notice throughout your busy day. However, getting these minor details correct can make a big different in the look and feel of a building. We don’t really notice when a door works as intended. On the flip side, we’ve all opened a door that awkwardly knocks into a wall, furniture or another door – the door that everyone in your office knows the “trick” to opening. Since doors are one of the most frequently used part of your building, it is very helpful to know the “handing” of the door. Don’t be that person with incorrectly installed doors on your building. Correct door handing is easy to get right with a little effort. The placement of the lock on the left or right side of the door depends on the door’s swing. A door can either swing inward or outward. A door with an outswing will pull outside of the room when opened. Inswing doors will push inside the room. It’s pretty simple. It usually makes sense for doors along a hallway to swing into their rooms so the hallway doesn’t get clogged with doors swinging open. Doors on the exterior of a home usually feature an inswing door as well to protect the hinges from being removed by an unwanted intruder. This also prevents the door from slamming shut if it’s propped open on a windy day. So how does door handing relate to the swing of the door? The swing will determine which side of the door to put the keyed door handle on. It’s easiest to open a door handle when you have a little extra leverage to push or pull it open. We usually open doors by reaching at an angle instead of straight on. If a door has a mortise lock, handing is critical for the keyed lock installation. If you hand your keyed mortise lockincorrectly, you will have the cylinder hole prep on the wrong side of the door. 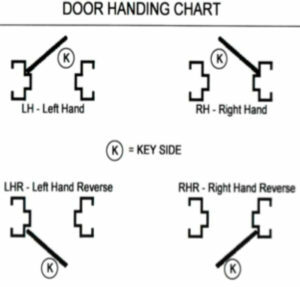 Here is a door handing chart to help you determine what door you have and where the door handle/lock should be based on the swing. Door handing can be confusing, but it helps your door supplier order the correct doors. If you don’t get it, that’s ok. The Midwest Door and Hardware team is filled with experts in their field. When you have doors that need to be replaced, give us a call and we can assist you on-site.